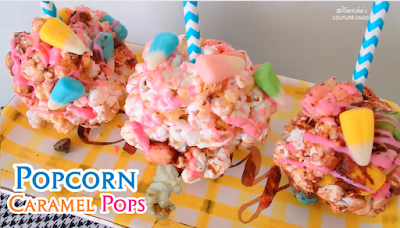 Click above to watch the full video tutorial and support my YouTube channel by liking and subscribing. I appreciate allof the love. 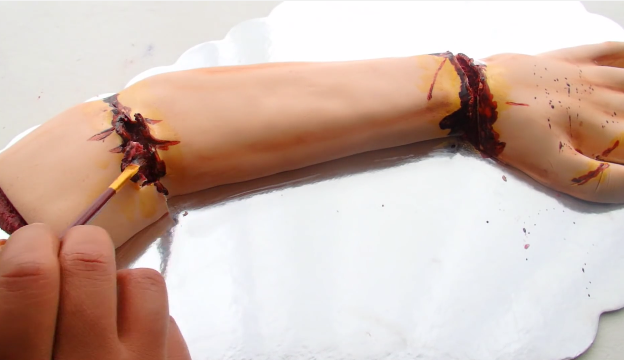 We're going to start off by making a rolled cake for the arm. 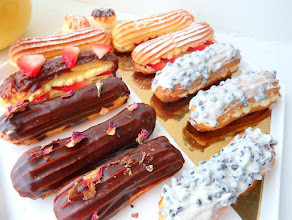 To do this, grease a jelly roll pan and line with parchment paper. 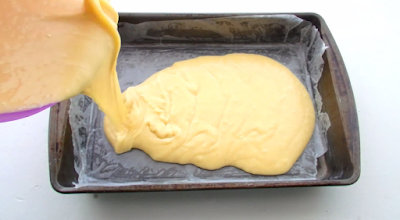 Pour enough batter to come up about an 1 inch (enough for 1 9 in. pan). Bake for about 15 minutes at 350 degrees. When baked, remove from the pan while warm. With the parchment attached to the bottom, lay another piece of parchment on top. Roll the cake up and allow to cool. 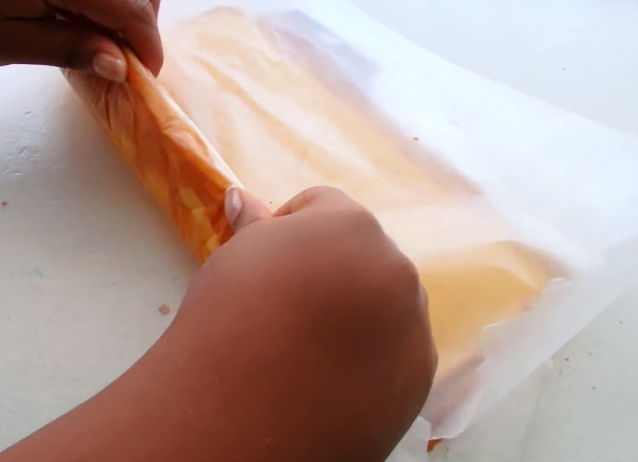 Once the cake is cooled, carefully unroll it and remove the top layer of parchment. 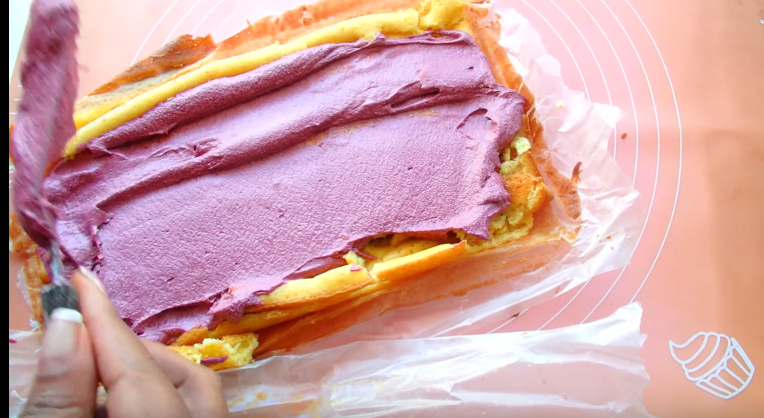 Smear with red frosting and roll back up, using the bottom parchment to help roll the cake up while peeling it away at the same time. Measure the cake with your own arm to decide where the elbow would be. Cut that piece, bend it and cover the cake with frosting, smooth and refrigerate until cold. 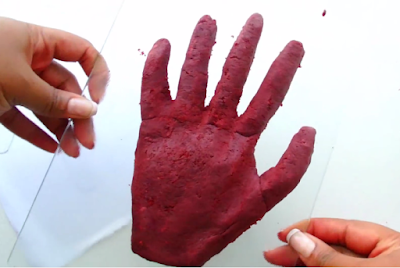 For this you'll need to make a cake dough and a tracing of your own hand. Make a cake dough by adding a bit of frosting to cake crumbs and combine until the dough can be easily molded (similar to clay). Place a piece of parchment onto the stencil and shape the cake dough to the hand stencil. 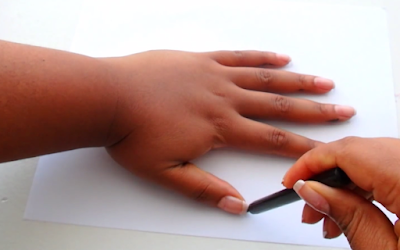 Watch the video tutorial to get a full grasp of this step. Allow the cake to chill until hardened. 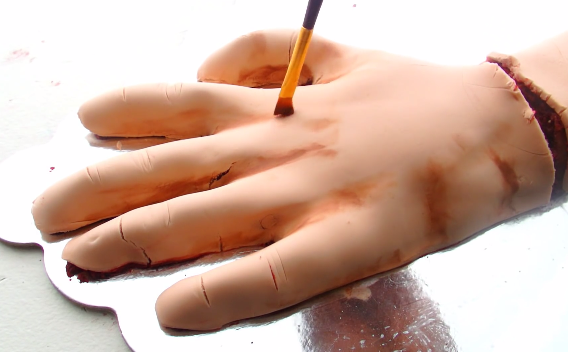 Carefully remove the hand from the parchment and attach to the arm. 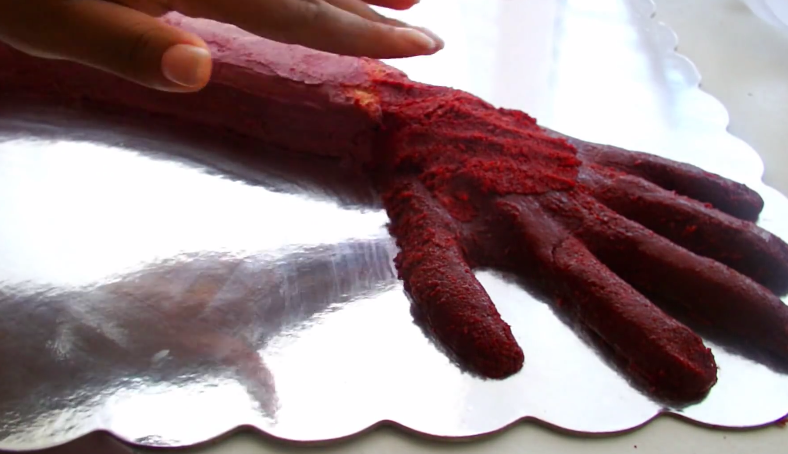 Use cake dough to shape the arm into the hand, then cut a small gap away from the wrist. Roll out the fondant and cover the arm and hand separately making sure to keep that gap open. 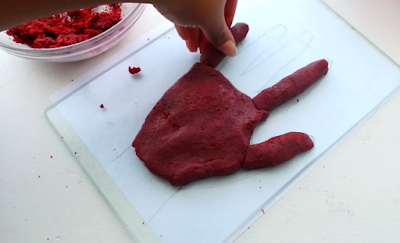 Carefully shape the fondant around the fingers. This is easiest when using a fondant ball tool to get in between fingers. Then cut away the fondant and tuck any extra under the arm. 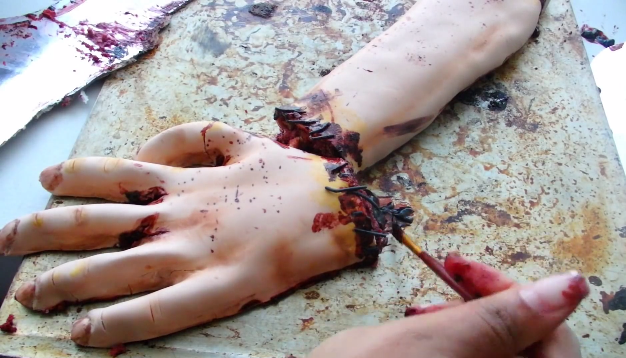 Cut knuckles into the fingers. I then used brown petal dust to add shadow and bring out muscular features to the arm. This step is crucial to make a realistic arm. Bring the dust between the fingers, around the knuckles and down the arm. Remember to blend out the dust so that there are no harsh lines. Make the fingernails by indenting with a small tool. I used the back end of a paint brush. Then dust the edge with brown petal dust. This is when you'd make any small or large cuts into the arm and fingers. 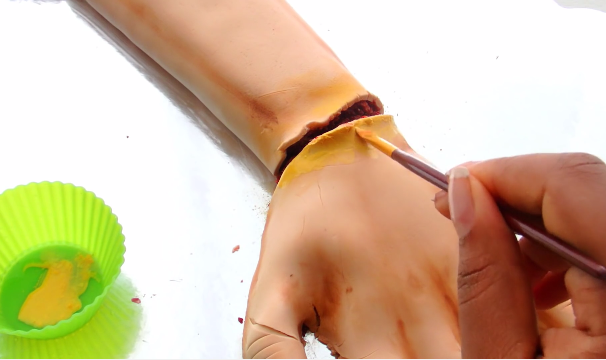 Add a small amount of water or clear extract to yellow petal dust (you can substitute with yellow gel dye) and color the wrist and all large and small cuts that you've created. Paint the cuts red with burgundy or maroon gel dye. 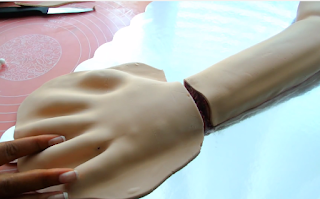 I then made a huge gash where the arm bends and painted that gash as well. Roll out a thin piece of black fondant and cut into 1 inch pieces. Place wherever you'd like onto the cake. I placed mine over the wrist gap. Don't forget to splatter some of the blood. 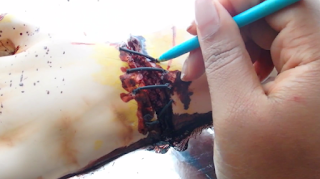 I made realistic blood my mixing maroon gel dye, strawberry cake filling, and water. 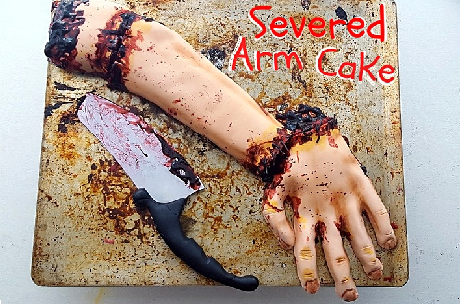 You can add this anywhere to the cake. I put a large amount at the end of the arm to make it look like it was bleeding out. 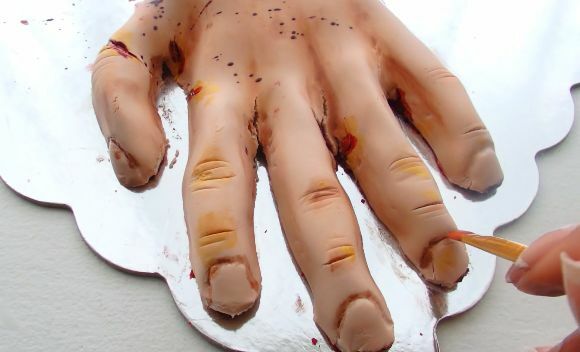 When placing the cake onto this sheet tray I decided to offset the hand which looked great. 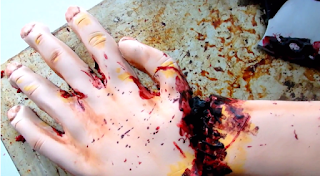 So, this is where I put the rest of the gory blood. I hope you all enjoyed this post. If you did, subscribe to the youtube channel and don't forget to like the fan page. 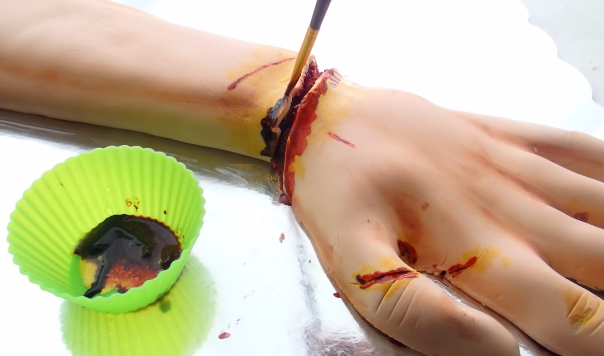 This vampire cookies and bloody milkshake look so yummy and best for any Halloween party too. This will make the Halloween party more amazing for everyone. I of course required to jot down down a right away word to carry owing to you for those prime notch recommendations and thoughts you are exhibiting upon this computing machine.